What would have made Improve Your Conversations: Think on Your Feet, Witty Banter, and Always Know What to Say with Improv Comedy Techniques better? How to improve your conversations: don't have a monotone voice like this narrator. Would you be willing to try another book from Patrick King? Why or why not? If it isn't narrated by the same person, possibly. A narrator with a voice that changes tone every once in a while would be nice. I prefer not to fall asleep at the wheel when i'm listening to this on my daily commute. I couldn't even get through the first 2 chapters. 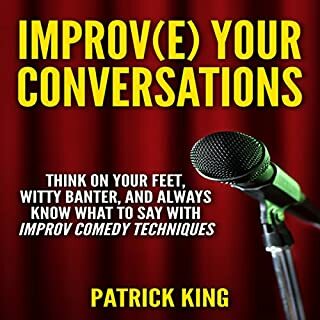 What character would you cut from Improve Your Conversations: Think on Your Feet, Witty Banter, and Always Know What to Say with Improv Comedy Techniques? GET RID OF THE NARRATOR!!!!! !